Airport Visit - The Cape Academy of Maths, Science & Technology: Centre of Excellence! 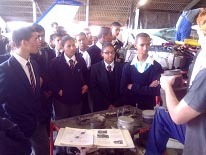 ... "Praestantia"
Some 30 Students of the Aviation School at the Cape Academy recently enjoyed an outing to Cape Town International Airport’s General Aviation area. 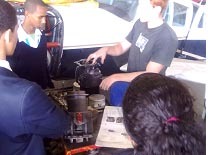 During their visit to the workshops of Cape Aero Services, an Aircraft Maintenance Organization, (AMO) they received first-hand information on aeroplane performance and maintenance presented by Tyrone Evans, a trainee Aircraft Maintenance Engineer (AME) who is currently serving his apprenticeship. Here they were shown the various components of an aeroplane engine, which they are currently studying on their course, and learnt why these engines are different from car engines. The mechanical workings of the various engine components was demonstrated and explained, giving the students a much better understanding of how the aircraft engines work and what will happen when they, as prospective pilots, are one day operating this equipment themselves. They also visited the hangar of Alyd Air, where Chief Instructor, Clair Fichardt (a retired SAA Captain) and lecturer Chris Arnott, a commercial pilot, gave the students practical demonstrations. 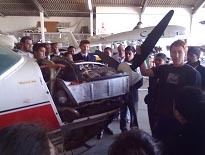 The students saw different types of aircraft, their components and the controls, and discussed various aspects that the students had just learnt in theory for their first and second examination of Module 1 (Principles of Flight) which they wrote in April and May 2011. Students had the opportunity to sit in the aircraft cockpit and experience the operation and practical functions of the controls.